Apple on Thursday introduced a new Try Before You Buy section to its popular App Store, highlighting "lite" and free apps in the storefront. The new section is intended to make up for the lack of a return and free trial policy in the App Store. Still, it's not exactly a match to Google's Android Market policies that protect you from paying for dud apps and are more consumer friendly. The Try Before You Buy (iTunes link) section can be found under the Free On the App Store spotlight, in the Featured tab, and can also be accessed from iTunes. At the moment 98 applications are featured in the section, all of which are free or "lite" versions of paid apps and games. Most of the apps in the Try Before You Buy category were especially developed to compensate for the lack of returns/refund policy in the App Store, and were already available in the store. The new section just highlights them. In comparison, Google's Android Market has a popular 24-hour refunds policy, provided you haven't previously installed and uninstalled the same application. Symbian users can download trial apps, and Microsoft's Windows Phone 7 marketplace plans to offer trial apps as well. The new Try Before You Buy section would also be a step to fight app piracy, Mark Gunman of 9To5Mac suggests. Earlier this week, a new painless, browser-based jailbreak tool was released for iOS devices, allowing users access to the Cydia app store, and a gateway to pirated apps. 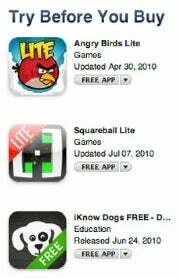 Apple said earlier this year that it had paid developers selling apps through its App Store more than $1billion. With an easy way to jailbreak their phones and install pirated apps, the developers' well being is at stake, and of course, the crown of the Apple Store. Apple's iOS app store hosts more than 225,000 applications, while the closest competitor, the Android Market, clocks in excess of 70,000.